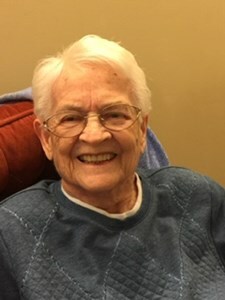 Marilyn Agnes Ross, 89, of Olathe, KS, passed away on April 4, 2019. She was born on July 26, 1929 to Myron and Ruby (Crane) Hinkley at Riverside, CA. On August 1, 1953, she married Sigurd C. Ross, and they made their home in San Jose CA, later retiring to Olathe KS. Marilyn worked as an elementary school librarian in San Jose for the Oak Grove school district. Marilyn is survived by her loving children Clifford D. Ross of Pleasant Grove UT, Laural DeRita of Red Bluff CA, and Kendal S. Ross of Olathe KS, 6 grandchildren and 20 great-grandchildren. She was preceded in death by her parents, husband, sisters Mayone McGregor, Marcia Hinkley, and brother H. Marvin Hinkley. Funeral services will be held on Friday, April 12, 2019, 10:00 am at The Church of Jesus Christ of Latter-day Saints, 15915 W. 143rd St, Olathe, KS, with visitation offered at 9:30am. Interment in Oaklawn Memorial Gardens will follow the service. In lieu of flowers, memorial donations are suggested to the Alzheimer's Foundation of America. Add your memories to the guest book of Marilyn Ross. Our family spent the afternoon weeding and digging in the backyard of Sig and Marilyn's house. She invited us inside for gingerbread and fellowship! Always so interesting and fun!